The , , , and intershell Rydberg series of the he- lium-like ions are investigated in the framework of the modified Atomic Orbital Theory (MAOT). Highlying energy resonances of He and excitation energy of the helium-like Li+ up to n = 10 are tabulated. In addition, total energy positions for lowlying states (n £ 4) of the helium-isoelectronic sequence with Z = 2, 3, 10 are also presented. All the current results agreed well with the published values. The data listed in this paper may be useful guideline for future experimental and theoretical studies in high-lying 1,3P˚ autoionizing states of two-electron systems. Studies of excited states in two electron systems have been an active field of research both experimentally and theoretically since the earlier synchrotron radiation source experiment of Madden and Codling on He . At present, the description of the properties of the excited states in the helium isoelectronic series is done in the framework of the new classification scheme with the label . In this notation, N and n denote respectively the principal quantum numbers of the inner and of the outer electron, S the total spin, L the total angular momentum, p the parity of the system, K and T are angular correlation quantum numbers and A represents the radial correlation quantum number of the two electrons. Besides, this designation incorporates singly excited states and both intrashell and intershell excited states in the helium-like ions. A given channel µ is labelled by as originally used by Herrick and Sinanoglu [2,3] with the following assignment of K and T for a given N, L and p T = 0, 1, 2, , min(L, N – 1). K = N – 1 – T, N – 3 – T, , – (N – 1 – T). These assigned values of K and T depend not on the total angular spin S. Besides, T is roughly speaking the projection of L onto the interelectronic axis and describes then the orientations between the orbitals of the two electrons and K is related to cosinus of the interelectronic angle as K » – ár< cosq12ñ where r< denotes the radius of the inner electron. Physically, the larger the positive value of K, the value of is closer to unity. In addition, A can take the values +1 or – 1 and 0 only [4,5]. For the A = +1 states, the two electrons tend to approach or to move away from the nucleus in phase and for A = –1 states, the two electrons have out-of-phase such that, when one electron approaches the nucleus, the other tends to move away from it [4,5]. For A = 0 states, they are little radial correlation between the two electrons and they are similar to singly excited states [4,5]. intershell Rydberg series of the helium-like ions up to Z = 10 and n = 10. Then, in this paper, energies for high-lying 1,3P˚ autoionizing states of He-like ions below the N = 2 hydrogenic thresholds are tabulated using the modified atomic orbital theory (MAOT) in the framework of a semi-empirical procedure. The results up to Z = 10 compare well to some theoretical results. In addition, it is also demonstrated in the present work, the adequacy of the MAOT’s formalism to separately identify the classification (+, -) of the Rydberg states without complex calculations. The data quoted in this work may be of interest for future experimental and theoretical investigations in high-lying 1,3P˚ Rydbergs series of two-electron systems. In Section 2, we present the theoretical procedure adopted in this work. In Section 3, we present and discuss the results obtained, compared with available theoretical and experimental data. For the empirical evaluation of the si-screening constants in Eq.4, we use the experimental energy results of electron ejected of Hicks and Comer  and photoabsorption experiments of Madden and Codling  on He along with photoionisation experimental values of Diehl et al. of Li+ quoted in Table 1. These energies are measured with respect to the ground state of the corresponding system. On the basis of these experimental data, the si-semi-empirical screening constants are evaluated using Eq.4. The results obtained are listed in the last column of Table 1. Table 1. Experimental energy resonances (E) of doubly excited states of He and Li+ used to evaluate empirically the si-screening constants in Eq.4. The empirical data of the si-parameters are quoted in last column of the table. The energy values are reported in eV. For energy conversion, the ground state energy of He at −79.01 eV and that of Li+ equals to −198.09 eV are used along with the infinite rydberg: 1Ry = 13.605698 eV. Table 2. Comparison of our results from the present modified atomic orbital theory (MAOT) with other theoretical results of , , and autoionizing states of the helium atom: saddle-point complex-rotation method (SPCR), Chen ; close-coupling method (CC), Oza ; truncated-diagonalization method (TDM), Conneely and Lipsky , complex coordinate rotation (CCR), Ho , Screening constant by unit nuclear charge (SCUNC) results, Sakho , results from Debye screening model (DSM), Kar and Ho . Table 3. Comparison of our results from the present modified atomic orbital theory (MAOT) for some autoionizing states of the helium isoelectronic sequence with complex-coordinates rotation method (CCR), Ho  and computing double sum method (CDS) over the complete hydrogen spectrum Ivanov and Safronova . Screening constant by unit nuclear charge (SCUNC) results . All results are expressed in atomic units. Table 4. Comparison of our results from the present modified atomic orbital theory (MAOT) for excitation energies of and autoionizing states of Li+ complex—coordinate rotational (CCR) results Chung and Lin . Here and in , the energy of each state is measured from the ground state of Li equals to—07.280521a.u with 1 a.u. (7Li) = 27.20927 eV, which includes the reduced mass correction. Screening constant by unit nuclear charge (SCUNC) results . All results are expressed in eV. modified atomic orbital theory (MAOT) with the saddle-point complex-rotation method (SPCR) , the closecoupling method , the truncated-diagonalization method (TDM) , the complex coordinate rotation (CCR) , the screening constant by unit nuclear charge (SCUNC) results  and with the data from Debye screening model (DSM) . The calculations agree well with each other. 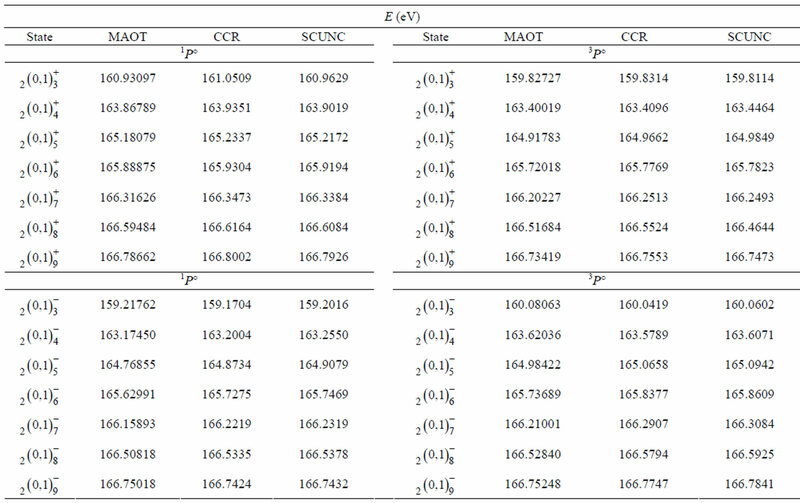 Table 3 indicates the present MAOT calculations for some autoionizing states of the helium isoelectronic sequence (Z = 2 - 10) compared to the CCR data , the SCUNC results  and to the CDS calculations . It is seen that the present results compared well to both CCR , SCUNC , and DSM  results. 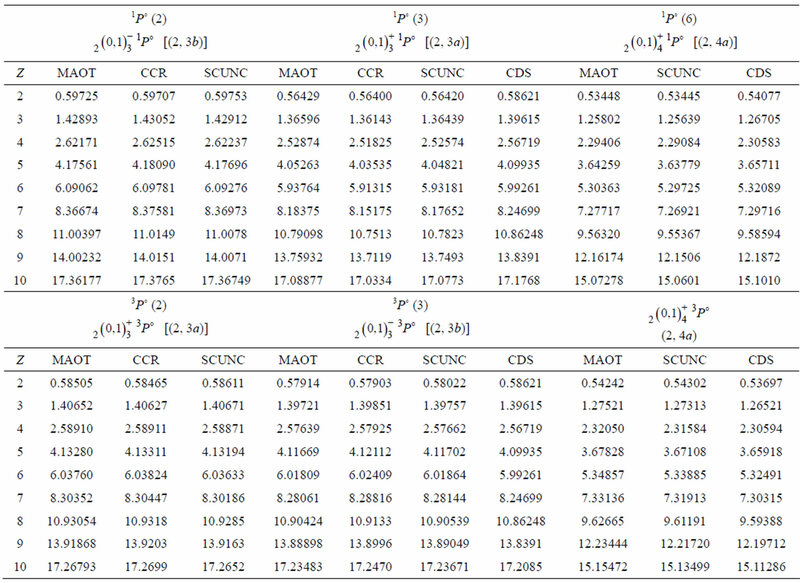 As far as the slight discrepancies between the MAOT results and that from CDS, they are mainly due to the fact that the formalism of Ivanov and Safronova  is done in the framework of the independent particles model which disregards the classification (+, -) of the supermultiplets investigated. This may point out the merit of the present MOAT formalism to identify separately the classification of the Rydberg states in the framework of a simple analytical procedure. The present calculated excitation energies of the , , and states of Li+ are listed in Table 4 and compared to the complex—coordinate rotational results of Chung and Lin . These authors have included in their theory reduced mass and relativistic corrections (correction to kinetic energy, Darwin term) and stated that their calculated resonance energies are expected to be accurate within a few meV. Even if the present MAOT formalism is for non-relativistic theory and where no reduced mass corrections are included in the calculations, it can be seen a good agreement between the present results and the complex—coordinate rotational data . As far as comparison with the SCUNC results is concerned, the agreement is seen to be also good. It should be mentioned that the good accuracy obtained in this paper indicates the adequacy of the MOAT formalism to treat the properties of the autoionizing states of two electron systems. The good results presented in this work may be explain by the fact that the s-fitting screening constants evaluated using experimental data incorporate implicitly relativistic corrections to the energy levels of the states investigated. In other words, the semi-empirical Formula (4) are not purely classical expressions. But, for sake of very good accuracy in the calculations, relativistic corrections and mass polarisation must be taken explicitly into account.